I read some months back about a rumour that suggested Apple would soon bring the hotspot ability to their iPhone range but as always, they remained tight lipped and it was difficult to get any official information. Apparently, the iPhone 4 has always had the capability of turning into a hotspot but Apple had yet to activate it for what ever reason. Yesterday, Apple not only announced the iPad 2 but confirmed the wifi hotspot ability was coming to the iPhone in March 2011. 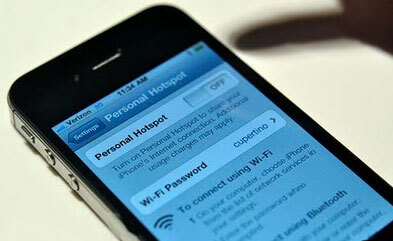 Unfortunately though, if you’re an iPhone 3G or 3GS owner, you’re out of luck; hotspot will only work on the iPhone 4. Australians have always had the ability to tether their iPhone (3G, 3GS, 4) to their computer via the connection cable but have to pay extra each month to enable the tethering ability. Some people felt providers were double dipping as their mobile plan already included data and felt it was unfair they had to pay an additional monthly fee to use this handy feature. Even though I own the Vodafone pocket wifi, I also have a mobile plan with TPG (piggybacking on the Optus network) that provides 2Gb of data allowance but I must pay a monthly fee to enable it’s use on my laptop. I decided it wasn’t worth the added cost to enable the functionality for 1 computer when for a little bit extra, I could get the Vodafone pocket wifi instead. Click here to read my review of that device. It looks like the same conditions are going to apply to the hotspot functionality on the iPhone 4. I say this because Americans will get access to IOS 4.3 (which enables hotspot capability) on March 11th but they will need to pay carriers such as AT&T or Verizon a monthly tethering fee in order to use it. I think it’s fair to suggest that Australian mobile carriers such as Telstra, Optus and Vodafone will follow suit and offer iPhone 4 hotspot data plans at an additional cost even if your current plan includes a sizable data allowance. Just about everyone knew that Apple would finally enable this ability on the iPhone but for me, yesterdays announcement has left me with more questions than answers. Firstly, will Australian mobile carriers allow consumers to use the hotspot functionality on the iPhone 4 at no added cost? I hope so but I doubt it. Is this unfair and akin to double dipping? Secondly, I’m sure many iPhone 3G and 3GS owners are going to feel a little cheated that this hotspot technology won’t be added to their mobile phone. I’m not sure if the 3G and 3GS have the ability to do this but given both have wireless capability, I’m guessing while technically possible, Apple opted not to enable it in order to move people towards the iPhone 4. While I own an iPhone 4, I also own the 3G model and it would be nice to be able to use that as a back up hotspot device when/if my battery runs out on the iPhone 4. Let me know what you think about the iPhone 4 hotspot functionality or anything else in the comments below. You *can* set up mobile wi-fi hotspot with iPhone 3G and 3GS if you jailbreak the phone. There is an excellent wi-fi/bluetooth/USB tethering applicaton called MyWi that can be downloaded via Cydia (the “liberated” iPhone app manager). Yeah, I’m aware of this but for the average consumer, jailbreaking isn’t really an option as it voids your warranty and/or they don’t know how to JB the device. Plus, the constant cat and mouse game can stop you from updating until the latest JB is released.